Culinary background: Chef Lev started cooking at age 15. 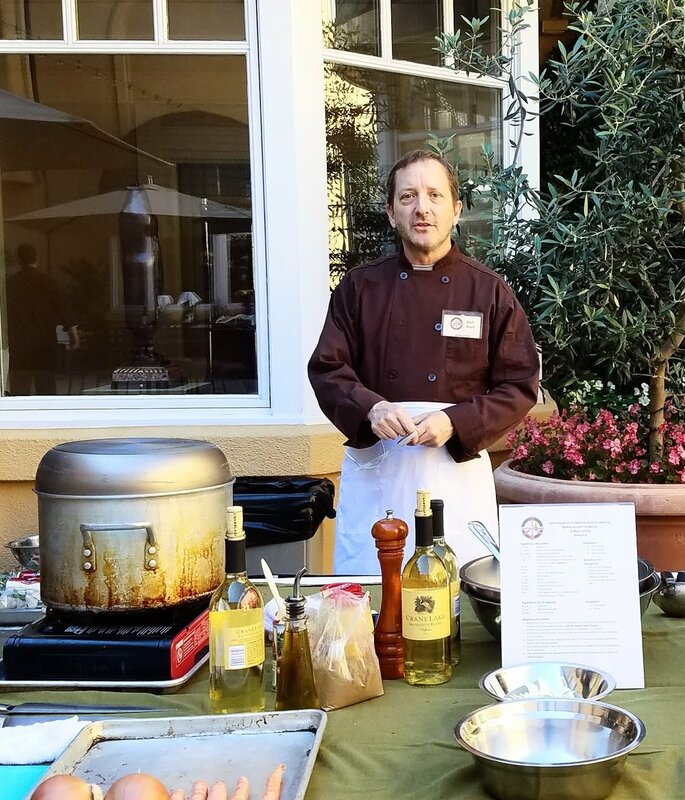 He graduated from the California Culinary Academy and was Executive Chef at the El Paseo in Mill Valley, Union hotel Benicia, and Devil Mountain Brewery. He owned the Lookout Hotel in Costa Rica and was a Chef Instructor at the California Culinary Academy and Le Cordon Bleu. Biggest influences: World Start foods and abundance of fresh foods in northern California. Favorite dish to cook: It depends on the season! Chef Lev loves to cook with seasonal ingredients, according to what is fresh and delicious at the moment. 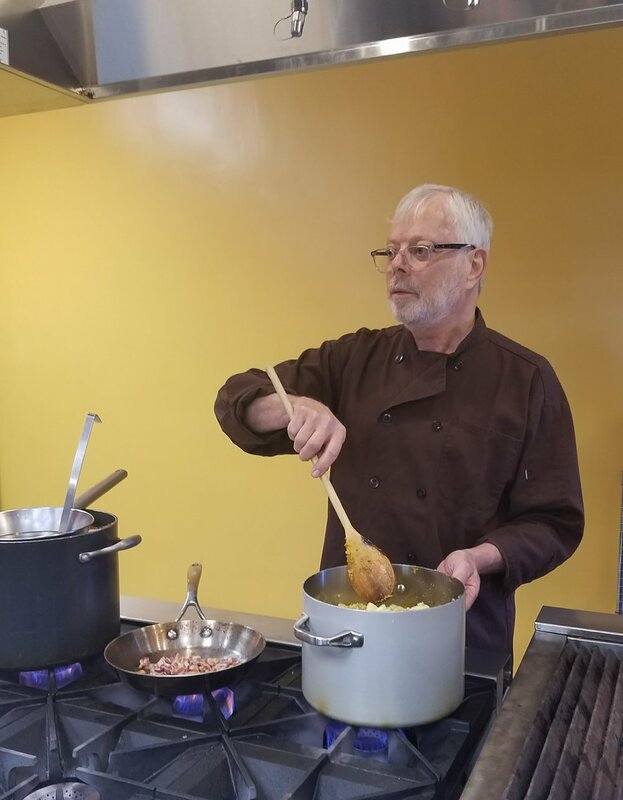 Favorite thing about teaching at Kitchen on Fire: Sharing his love of fresh California ingredients with the wonderful students at Kitchen on Fire! Culinary background: Trained in Paris/Chef de Cuisine and Owner of catering business in Philadelphia/Executive Pastry Chef and The Restaurant School, Philadelphia/ Executive Pastry Chef at California Culinary Academy (CCA)/Director of Artisan Bread Baking Program Le Cordon Bleu North America. Biggest influences: His Italian grandmother’s loving and generous hands in the kitchen. Favorite dish to cook: Bouillabaisse and a crusty baguette slathered with rouille - a garlic, saffron and cayenne paste thickened with day-old bread. Specialty: Shhh! Nobody knows he makes a mean Chicken & Andouille Gumbo! Favorite thing about teaching at Kitchen on Fire: Smart Students who have fun while they’re learning! 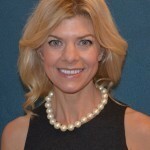 Carol Davison is an experienced Consultant Medical Herbalist and Nutritionist. She graduated from Napier University with a Bsc (hons) in Herbal Medicine. Carol was brought up in Northern Ireland and moved to London to study Complementary Therapies where she gained Diplomas in Massage, Shiatsu, and Nutritional Therapy. She went on to further study in Edinburgh, completing a four-year science degree in Herbal Medicine. Carol managed an Herbal Medicine and Nutrition Practice in both Ireland and Scotland for several years before relocating to the Bay Area where she worked as Culinary Coordinator and Staff Nutritionist at Kitchen on Fire. Now, along with consulting at Kitchen on fire, she teaches and sees clients on a one to one basis in the Albuquerque area, her new home. Culinary background: Chef Maria started cooking when she was a child, helping her mother with her catering business in Venezuela making homemade pastas, sauces and rustic breads. She moved to the United States in mid-2000 and trained at the California Culinary Academy, becoming a professional Pastry Chef. She has trained and baked at numerous prominent Bay Area restaurants, including The Rose Pistola, The Waterfront, The Market Hall, The Townhouse Grill & Restaurant and a stint at the famed Chez Panisse in Berkeley, where she learned about hand-selecting and gently preparing perfect produce from Alice Waters. Biggest influences: Her nonna Palma (grandma), her mother, Chef Gerardo Sainato at V. Sattui, Chef Oliver at Kitchen on Fire, Chef Alan Tangren at Chez Panisse and Chef Neucimar at Market Hall. Favorite dish to cook: Breads, focaccia, cookies, gnocchi, and experimenting with handmade ravioli. Favorite thing about teaching at Kitchen on Fire: How the setting and mood of Kitchen on Fire creates intimate classes. The team of chefs at Kitchen on Fire are great to be part of and very knowledgeable chefs. Chef Alain was born in Casablanca, Morocco and raised in Madrid, Spain. He also lived in Montreal, Canada before moving to Berkeley, California. He owned a hair salon for over 25 years but knew since he tasted his mother’s chocolate mousse that his real passion is desserts & pastry. 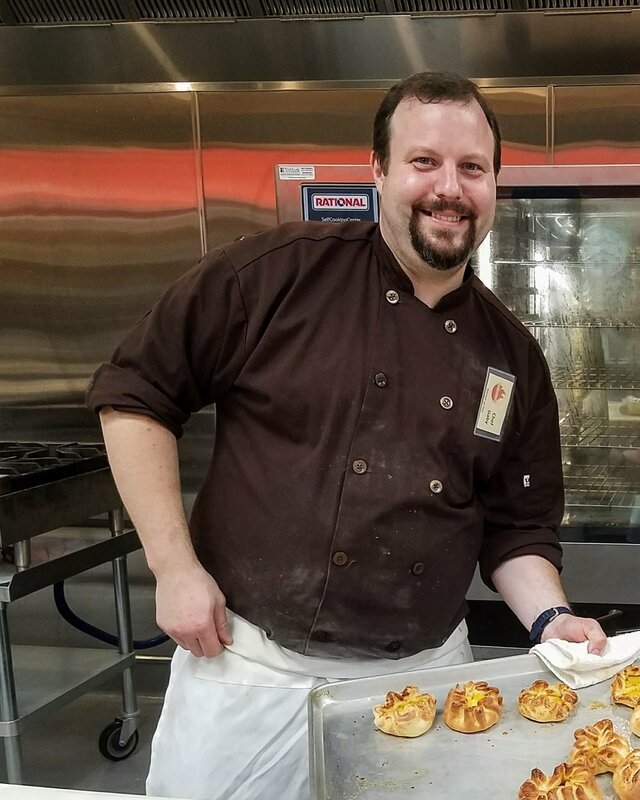 Alain pursued his passion and earned professional certification at the San Francisco Baking Institute, where he mastered the full spectrum of pastry skills. More recently, he received training at L’Ecole le Notre in Paris. He has worked at SFBI, Thorough Breads & Pastries, and Craftsman & Wolves in San Francisco. He has his own dessert catering company called La Noisette where he designs beautiful pastries and dessert buffets. 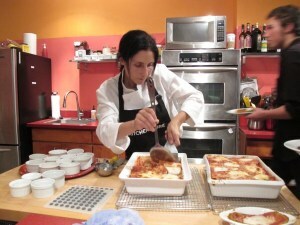 The granddaughter of an Italian cheese maker, Linda was born and raised in New England, earned a bachelor’s degree in psychology and a master’s degree in education, and then moved to the Bay Area to attend the California Culinary Academy, where she returned five years later as dean and adjunct faculty member. Linda is an award-winning culinary instructor and the author of Cooking School Secrets for Real World Cooks, honored as a finalist for both James Beard and IACP Julia Child First Book awards. The inaugural chef director at The Art Institute of California, Linda launched and directed their International Culinary School’s degree programs as well as the school’s student-staffed restaurant, Bistro 10UN. From 2004 to 2006, Linda served as Julia Child Director of Culinary Programs at COPIA: The American Center for Wine, Food & the Arts, in Napa. Linda has managed and cooked in several Bay Area restaurants, and has worked as the private chef for two prominent San Francisco families, special events catering chef at UCSF Medical Center, and as a member of the Paula Leduc Fine Catering offsite culinary team. For seven years she operated a home-based cooking school, LindaCarucci’s Kitchen. A 30-year veteran of the hospitality industry, Linda was recently honored with the Women Chefs & Restaurateurs Educator of the Year award, and the Lifetime Achievement Award from the San Francisco Professional Food Society. Also, her peers in the International Association of Culinary Professionals have bestowed on Linda the honor of Cooking Teacher of the Year. Linda loves teaching cooking classes in the Bay Area and beyond, and also enjoys working as a recipe tester and editor for the Weber Grill company. She holds a Level 2 Intermediate Certificate in Wines and Spirits from the Wine and Spirit Education Trust. A new member of the Kitchen on Fire team, Linda is looking forward to sharing cooking school secrets galore and having fun with you in the kitchen. 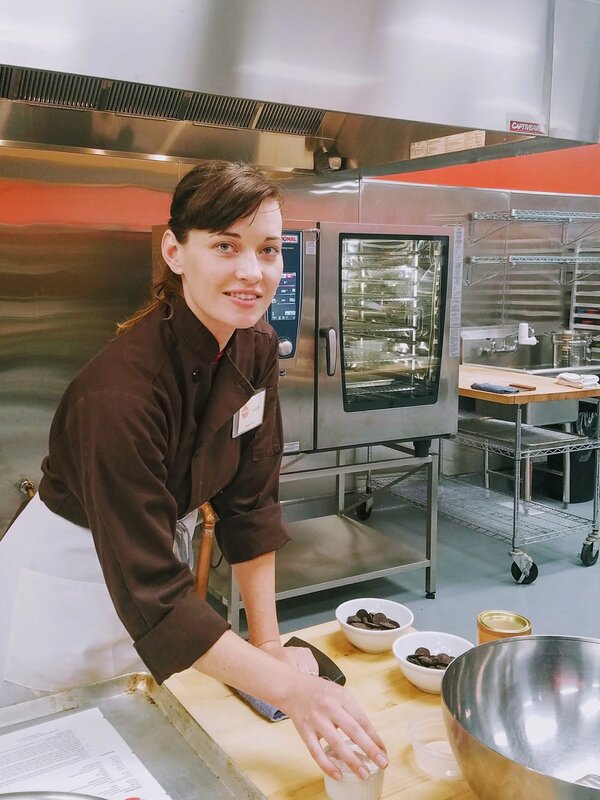 Culinary background: Chef Sydnee worked in bakeries since she was 16 and attended culinary school at San Joaquin Delta College. She interned at the San Francisco Baking Institute and went on to work as a Demi Pastry Chef and Assistant Instructor in Bread and Pastry Courses. Biggest influences: Her great grandmothers, who were amazing cooks and bakers. Chef Sydness says that her formal culinary education really began in their kitchens. She remembers being a bit of a pest by being insistent on helping them in the kitchen. She has many fond memories from that time, in which she learned to truly love food. "In food we find communion." Favorite dish to cook: The classic boeuf bourguignon. Favorite thing about teaching at Kitchen on Fire: Working with others who are as curious as she was to learn. Chef Sydnee loves to teach those who love to eat who are, in her opinion, the best kind of people! 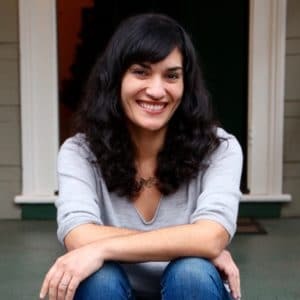 Originally from the Bay Area, Kaori Becker is an avid blogger and cooking instructor, having taught culinary classes and demonstrations in Columbus, Ohio at the Franklin Park Conservatory and The Seasoned Farmhouse. “Ka-o-ri” means “fragrance” in Japanese, and Kaori has always been passionate about recreating delicious, fragrant dishes from her Japanese tradition, enjoying local farm-to-table eating, and sharing sumptuous food memories with friends and family. Her specialty originates in Japanese food, growing up as a half-Japanese woman in California, and learning how to cook traditional Japanese meals and desserts from her mother, who is a first generation full-Japanese. These authentic Japanese recipes have been passed down to Kaori through her Japanese grandparents who owned an authentic ramen noodle shop in the countryside of Fukushima, Japan. Kaori recently graduated Ohio State University’s Masters program to become a certified English teacher, focusing on teaching literature to students through the imagery of food. Kaori is currently creating her own culinary business and lives in the Bay Area with her husband and animator Alan Becker. Born and raised in Oklahoma City, Elise “Toddy” Fineberg followed an unusual path to pastry. 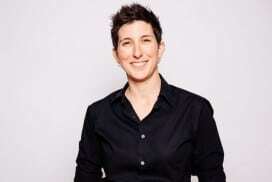 Before making her way into some of San Francisco’s most notable kitchens, Fineberg spent her college years at Oklahoma State studying science, zoology and sociology. 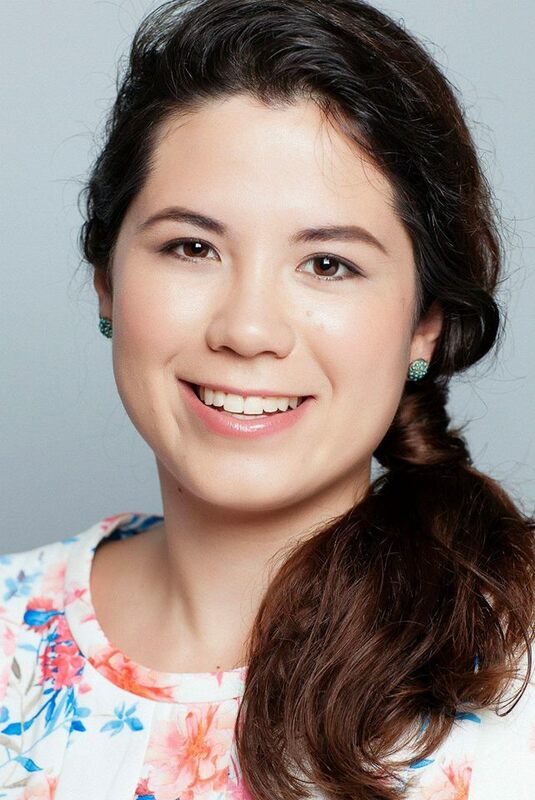 Upon graduation, she took up social work in Austin, Texas. After three years, Fineberg moved to San Francisco where she continued community service work and quickly found herself enamored of the city. In 1999 Fineberg enrolled as a culinary student at the California Culinary Academy, took her first pastry class and was hooked from the start. She soon secured a position at Citizen Cake where she learned a principle that is now her own philosophy: great food relies on serious integrity, and that means the best ingredients and absolutely no shortcuts. From there Fineberg went on to work in many critically acclaimed restaurants and catering companies in San Francisco: Jardinière, the legendary Stars, and Incanto. In her next post as Executive Pastry Chef for Taste Catering, Fineberg created desserts for large-scale events while maintaining her commitment to making everything in-house. After just over three years, she accepted the opportunity to open a new restaurant at the Seattle Art Museum, coincidentally also named TASTE. 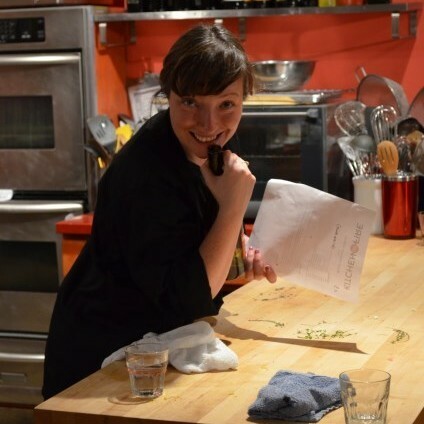 At TASTE, she began to analyze the way we experience food, and as a Pastry Chef she thrived. She returned to San Francisco a year and a half later, and began a new chapter by becoming a Chef Instructor at the International Culinary School at the Art Institute. 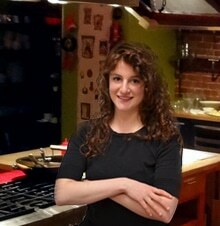 She also began to focus more on the savory side of the kitchen, teaching culinary as well as pastry classes. Even though she loved it, she couldn’t pass up the opportunity to open Prospect Restaurant, but after a year and a half, she gravitated back to the Ai. In February of 2014 Chef Fineberg earned her CEPC. She continues to teach the next generation of great cooks (pastry, savory, and beyond) and is thrilled to have such an impact on her students. Chrysta Wilson is the owner, founder, and Senior Pastry Chef of Kiss My Bundt Bakery, a boutique bakeshop located in the Beverly Hills/West Hollywood Triangle in Los Angeles Country. Chrysta grew up in the South where made-from-scratch desserts were as common as the Sweet Tea that accompanied them. She started her first bakeshop at the age of 7 using her Easy Bake Oven and watched how people came together over the sweets. Her family moved out of the south when she was a teenager, relocating to the East San Francisco Bay Area. Before returning to her first occupation as a baker, Chrysta received a Bachelor’s Degree in Public Policy and Management and a Masters Degree in Public Administration from the University of Southern California. From 1998-2008 she worked in the field of community building in roles that included community organizing, public policy analysis, and urban planning. Interestingly enough, it was in her role of community organizing that Chrysta created the concept of Kiss My Bundt Bakery. For Chrysta, Bundt Cake was a way of bringing people together because everyone loves sweets. As her bundt cakes became a part of her community building, she began to informally build a business. 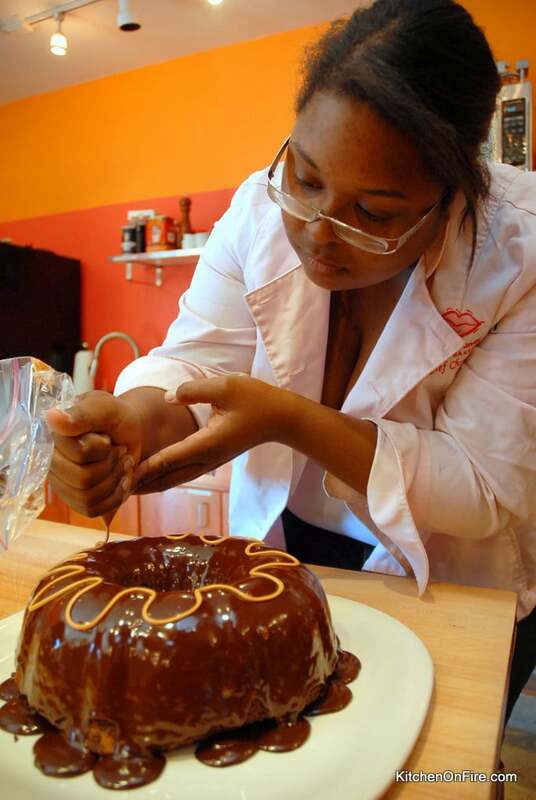 In 2005 Chrysta started Kiss My Bundt Bakery as a web-based cake-catering company, growing the company and baking all orders while simultaneously growing in her community building career. In 2008, Chrysta left her role as Senior Regional Director of a major children’s nonprofit agency to oversee the final construction of her retail bakery and to build her public policy consulting business. Now fully in her role as an award-winning pastry chef in Los Angeles, this Southern transplant is best known for her Californian-spin on a Southern Dessert (the Bundt Cake). Since her bakery opened in August 2008, Chrysta and her bakery have received a number of awards and accolades from such publications as the Los Angeles Times, NBC Los Angeles, NBC’s Today Show, 944 Magazine, BlackBook Magazine, Fox11 Hotlist, TastingTable, and others. Her style of baking and cooking is simple, with an intense focus on flavor development in terms of her cakes and confections, and an overall commitment to well-balanced, not “overly sweet” desserts. In November 2009, Chrysta added cookbook author to her resume as her cookbook, “Kiss My Bundt: recipes from the award-winning bakery” was release locally to exceptional reviews with a national launch planned for June 2010.